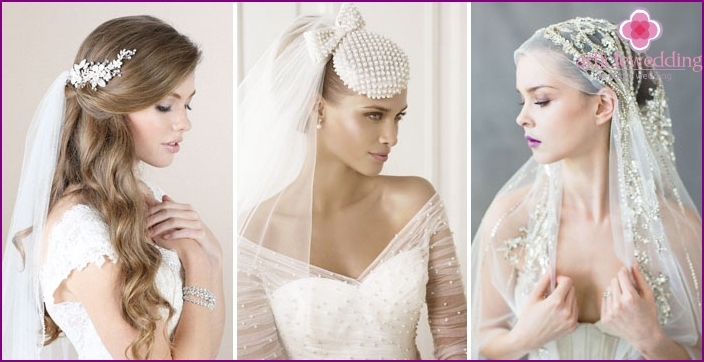 In today's world, the number of wedding fashionproposed veil options will satisfy even the most capricious bride. According to the importance of this accessory is in second place after the dress. The main criterion for selection is the image of a veil perfect harmony with the whole outfit the bride. The successful model of a beautiful dress can be transformed into stunning. It is important to determine which items of clothing to emphasize. 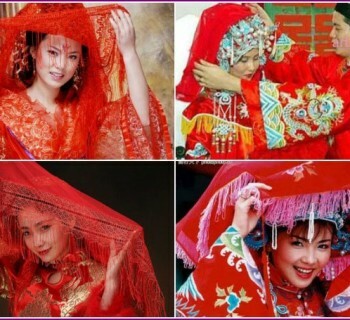 If the dress of a beautiful fabric, suitable transparent, weightless veil. Through it is clearly visible pattern apparel. The model is combined with an open back with a short veil. 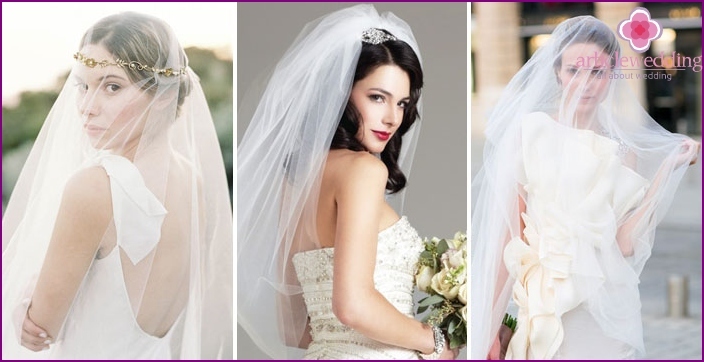 In the first place, wedding veil is selected in tonedress. The color should match exactly. 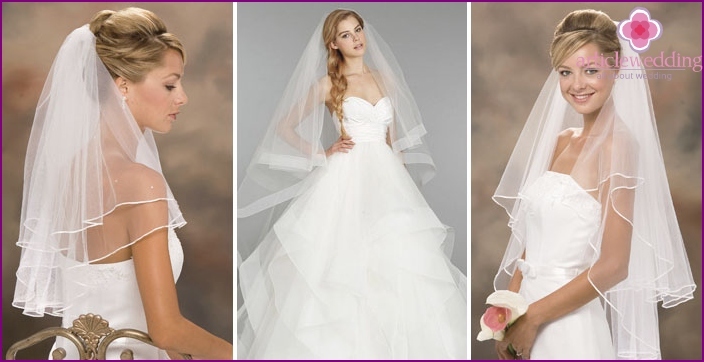 Based on the style dresses, veils determine the model. It can be short to shoulder length, medium to elbow, elongated mid-thigh and a floor-length, often passing into the loop. veils Decor has its differences: the decoration can be made of glass beads and beads look great embroidery, ribbons and lace. 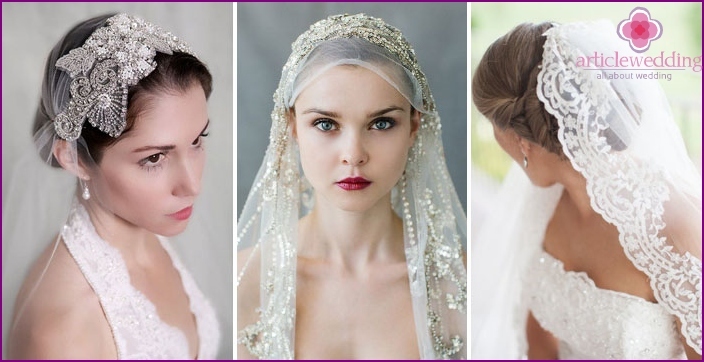 What are the features of the most attractive models of this headdress bride? As a rule, edged with satin ribbon, veilIt looks better medium length. She is two or three tiers. For convenience, the top layer can be used as a veil during the wedding ceremony in the church. The tiers may be the same or different lengths. A narrow satin ribbon sewn on the edge of the veil. This style must necessarily conform to the image of the bride. Dress in a classic style, satin or other smooth fabric and veils fringed ribbon - perfect duo for the image of the bride. This headdress can come under the weddingdress, embroidered with Swarovski stones, rhinestones, sequins or beads. Fatou's better to pick a bunk, length - up to mid-thigh. The area of ​​the material allows to lay beads or rhinestones ornament, floral design. No worse looks veil, where brilliant points are scattered in a chaotic manner over the entire surface or on the edge. In a dark room, the beam of light is directed to the bride, bright stars will flash and mysteriously flicker. Fatou is fixed on the tiara, which also decorated with great decor. 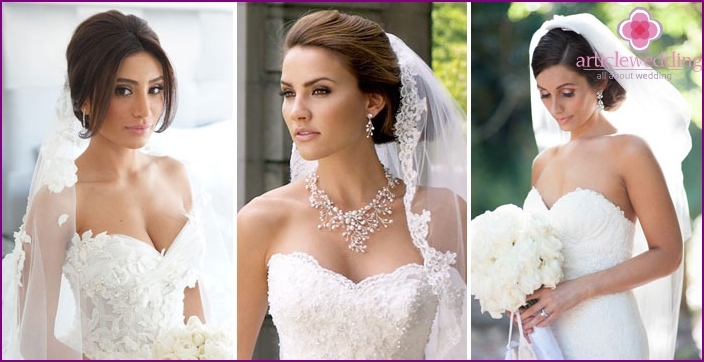 If you decide to choose a veil with lace edge, orembroidered, look, if it is combined with the dress details of the decor. Some finishing elements can be repeated and overlap each other. 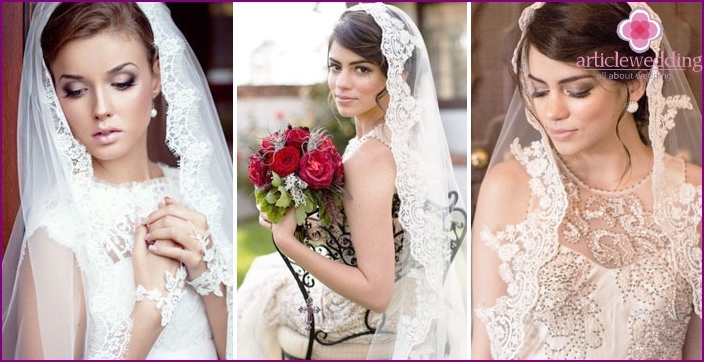 Lace veil or with embroidery is not very lush, but provides not just one, but two tiers. Bride having nice shoulder line can wear a dress with an open top. Such attire wonderful harmony with the lace veil, through which easily visible graceful outlines lovely bride. Buying veil fixed on the crest, you need toprovided the length of hair of the bride. A suitable option - a luxurious updo. The most magnificent part of the multi-layer veil is going to one point, which is attached to the scallop. This model is very suitable for the gentle image of the bride. Scallop not seen prying eyes, a light cloud of tulle gently wraps the bride from all sides. The veil can be long or not, depending on the wishes of the bride. Very short tiered approach to the veildress with a high collar or intricate details in the bodice. Then all those present decoration beauty is visible, which is emphasized. 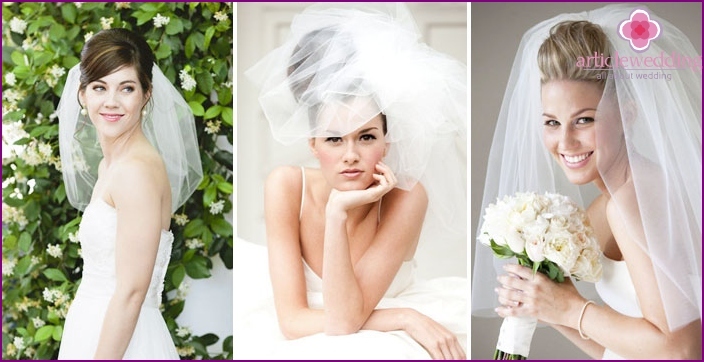 This type of veil is well combined with a short wedding dress with a fluffy skirt. Naughty appearance implies an image of a young bride. The dress can be long. Then the veil should be open low-necked top, where in the area of ​​the neck there are decorative ornaments. Secured hat using pins or barrettes. White veil creates the image of a special atmosphere,enveloped by a halo of mystery bride. That she did not look like the subject of a separate toilet, you should consult in advance with the stylist. Thinking through every detail of the hair styling, combining a hairstyle with a cloud of tulle, you can get enchanting appearance. An experienced master will advise what type of person will approach one or another version of the installation. 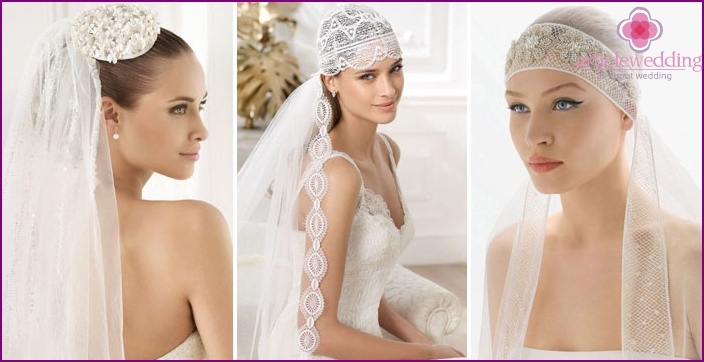 When choosing a veil for the wedding, it should be remembered that it should stay firmly on the hair. Depending on the stacking distinguish these types of fastening hat: the center, above or below the hairstyle. Volume veil will look amazing inholders of a round face. Pick up the hair in a pony, to secure the top wedding accessory, reflected in the mirror image of the beauty of a good tale. This option is preferable for those who like smooth bangs. They need to make a choice in favor of the light and airy styling with delicate swirls. Splayed hair long tolerated in combinationwith multi-layer long veil. If the bride has such a wealth, like a scythe, it is impossible to hide from prying eyes. Femininity image with flowing, slightly wavy curls incomparable to anything else. Fata in this case is attached to the back of the head and covers the entire length of hair. Sometimes stylists offer for her to make bouffant. This applies to both long and short hair. Multi-layer veil requires volume and even pretentiousness in packing. The combination of multi-tiered headdress and tiarasIt implies a high hairstyle based on the "horse's tail" or loose soft curls. Babette will also look appropriate and original. Owners face square features is better to buy a veil of average length. Flatten some nasty little things help luxuriant hair. Cascade form veils visually correct the shape of the face. The simpler the veil, the richer must finish onbride and vice versa. 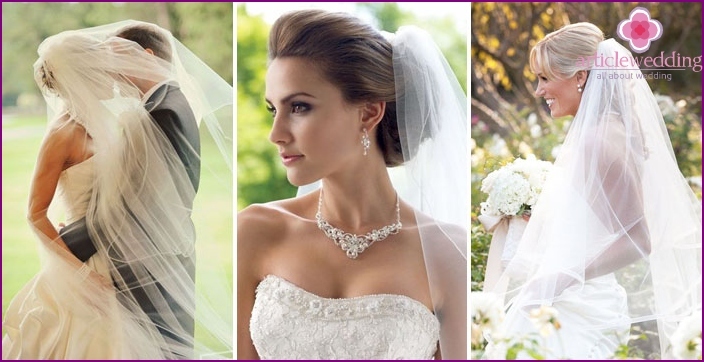 This constant postulate always need to remember when choosing accessories for bridal wear. Volume veil sometimes visually adds growth bride. This should be considered when choosing a hat. 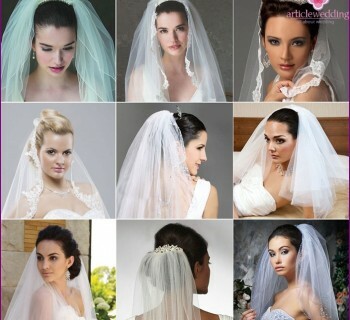 Look at the picture below, how many beautiful options veils. Style and hat length you choose. The main thing that the new accessory has been a talisman of family life.